VW’s updated 1.5L TSI “evo” 4-cyl. is used in Polo, Golf, Passat, Tiguan and T-Roc compact CUV. DETROIT – Volkswagen is preparing to launch an aggressive strategy for battery-electric vehicles with its new MEB architecture, but the German automaker is hardly forsaking internal-combustion engines, a top powertrain executive says. Wolfgang Demmelbauer-Ebner, executive vice president and chief engineering officer for VW’s North American Region, says at a media roundtable here last week during press days for the North American International Auto Show. Last year, VW launched in Europe an improved member of its popular TSI 4-cyl. gasoline direct-injected engine family (codename EA 211). This updated 1.5L high-compression engine, known as “evo,” relies on the Miller combustion cycle, which helps improve efficiency and reduce emissions and heat by allowing the intake valves to remain open during part of the compression stroke, Demmelbauer-Ebner says. 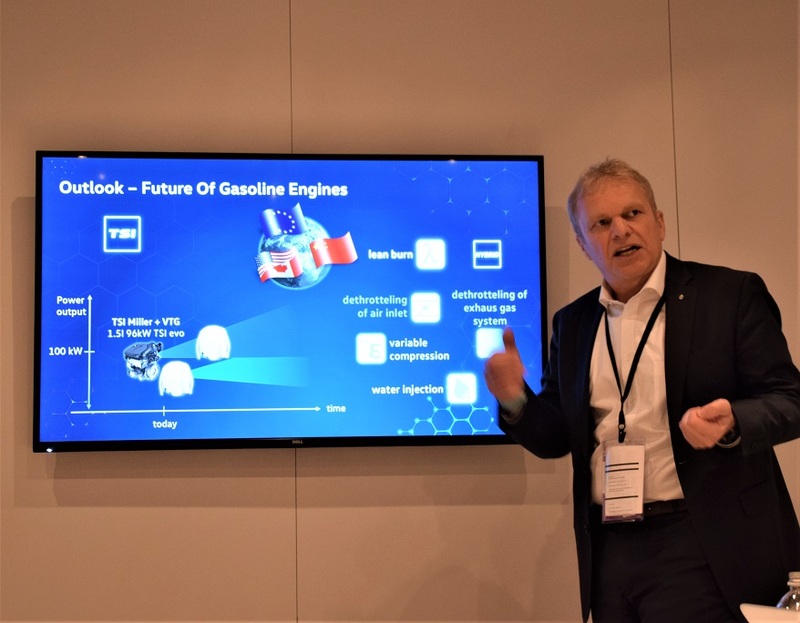 In Europe, the evo engine employs cylinder deactivation (marketed as ACT), and he says it is the first high-volume, mainstream gasoline engine using a variable-geometry turbocharger. Plasma-coated cylinder liners help reduce friction. VW’s first European vehicles using the engine are the Polo, Golf, Passat, Tiguan and T-Roc compact CUV. In the Golf, the evo 4-cyl. is rated at 147 hp (110 kW), with combined city/highway fuel economy as high as 48 mpg (4.9 L/100 km) on the European test cycle. “Here you see fuel consumption that is really the benchmark in Europe,” says Demmelbauer-Ebner (pictured below, left). Asked if this “evo” engine will appear in U.S. vehicles, he says engineers have been working on a more powerful version for the U.S. but that a final decision has not yet been made. The EA 211 engine family, including the updated evo, is VW’s highest-volume powerplant, reaching about 6 million units annually, Demmelbauer-Ebner says. He also says VW is making progress on variable-compression engine research, but the new EA 211 evo, by combining the Miller combustion cycle with variable-turbine geometry, achieves roughly the same objective as variable-compression technology, for a lot less money. Asked if the improved 4-cyl. would find its way into the Atlas 3-row SUV in the U.S., Demmelbauer-Ebner says there is no need for it at this point, as about 90% of Atlas models are sold with the 3.6L VR6 V-6. In 2018, VW sold 59,677 Atlases, placing it third in the Large CUV segment (behind Chevy Traverse and Nissan Pathfinder), according to Wards Intelligence data. Likewise, European shoppers have been more likely to choose the V-6 Atlas rather than the 4-cyl., he says. Overall, VW is keeping open the door to multiple powertrain technologies for the future, with hybrids, mild hybrids, plug-in hybrids, battery-electrics and optimized internal-combustion engines. Demmelbauer-Ebner says plug-in hybrids are unattractive to many consumers if plugging in produces only 25 miles (40 km) of all-electric range. But once that range is extended beyond 50 miles (80 km), “then people are more willing to plug it in,” he says. With or without a plug, Demmelbauer-Ebner says “there’s still a lot of potential with conventional engines.